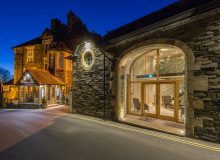 The Langdale Hotel & Spa, set in 35 acres of woodland and waterways in the heart of the Lake District, is the perfect place for getting away from it all. Massive millstones, a water-wheel, cannon and other relics are reminders of its former life, as a 19thC gunpowder works. The majority of the 57 bedrooms are located village-style, in historic properties around the estate, with just 5 situated in the main building. Each room is different – a number of special rooms have a 4-poster bed with double air bath. Others have a private balcony overlooking a stream. All rooms are en suite with whirlpool or air bath and are equipped with satellite TV, direct dial telephone and tea/coffee making facilities. The exclusive Country Club’s central feature is the 20m indoor pool, with bubble massage seat, dedicated swimming lane, spa bath and fully-equipped exercise studio. The health & beauty salon offers a full range of treatments for head-to-toe pampering. Our main, formal restraunt has recently been awarded an AA Rosette for the quality of the food and service. 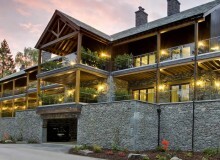 You are assured of a warm welcome and friendly service on the award-winning Langdale Estate.